CONTEST ENTRY IS NOW CLOSED – Congrats to winner Lauren H! We’ve partnered with Warner Bros. Home Entertainment for a giveaway of the brand new DVD release, The Tom and Jerry Show Season 1 Part 1: Frisky Business. Available January 13 for purchase (click here), this two-disc set includes 13 episodes from the all-new Tom and Jerry Show that premiered on Cartoon Network in 2014. To enter for a chance to win, answer the easy question in the Rafflecopter form below by January 26, 2015 (U.S. residents, 18+ only, no P.O. boxes). Official Synopsis: “The timeless adventures of Tom and Jerry are back in a brand-new TV show the whole family can enjoy! 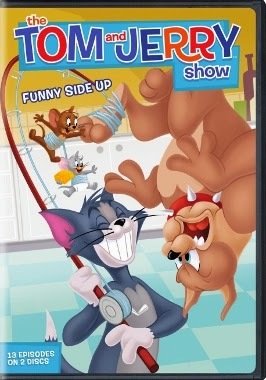 The Tom and Jerry Show Season 1 Part 2: Funny Side Up features 13 exciting escapades featuring Tom and Jerry and their favorite pals, including Spike and Tuffy. The pursuit takes off as Tom, Jerry and the gang fly through unfriendly skies in “Just Plane Nuts.” Detectives Tom and Jerry are on the case to find Spike’s missing dog bones in “Bone Dry.” Love is in the air when a mad scientist transports Tom and Jerry to Paris to meet a girl cat and a girl mouse in “Molecular Break Up.” Jerry and Tuffy cause havoc on a luxury cruise liner in “Cruisin’ for a Bruisin’.” These and several other hilarious episodes are featured in this entertaining set. One lucky winner will be drawn at random and notified via email. The winner will have 48 hours to respond to our notification with their complete name and U.S. mailing address (no PO Boxes). Failure to respond within 48 hours will result in forfeiture and another winner will be selected. For complete giveaway rules, click here. My favorite Hanna-Barbera cartoon is The Flintstones. I always liked Huckleberry Hound.